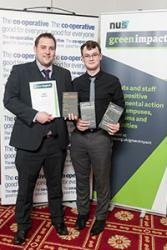 Rhys Dart (left) and Rhys Taylor of the Students’ Union at the Awards event recently.Bangor University Students’ Union have won an NUS Green Impact Excellence award, and were also one of the top five scoring Students’ Unions nationally for their Love Bangor Community Partnership project. This reflects local students’ dedication to positive environmental action over the last year, turning their union into a hub of sustainability at the heart of the wider community. This was a year-long reward project, allowing students’ unions who have achieved a Green Impact Gold award for two consecutive years to take a year’s break from the workbook. The excellence framework gives students’ unions the opportunity to work with their institutions on a bigger picture sustainability initiative, creating transformational projects, with support and guidance from NUS. Bangor University Students’ Union have been working on a community project, the Love Bangor Community Partnership. The focus of the excellence project was to create a student-led community partnership to involve students in civic and community life whilst developing strategic partnerships with key stakeholders. The Students’ Union successfully recruited three Student Community Wardens from different modes of study and equipped them with bespoke training to engage with the Local Authorities, Residents Associations, local councillors, Coleg Menai and the University. The Excellence project had a successful launch and consultation to build key relationships and interest in working on student-led initiatives. The first of these was led by the Student Community Wardens, the Love Bangor Hate Waste campaign. and an online information and resource hub was also developed to complement the work of the partnership. The University and Council have decided to support the development of the Partnership which bodes well for the long term success of this project. Over 100 students’ unions across the UK took part in the competition this year, taking actions like setting up a charity shop on campus, running biodiversity sessions with local schools, lobbying for a more eco-campus and promoting sustainability across the wider community. “At NUS, we get sustainability across campuses, curriculums and communities, and Green Impact really is at the heart of these efforts”. Green Impact offers a framework for staff and students to improve the ethical and environmental credentials of their union. Following a full environmental audit, Bangor Students’ Union was rewarded for their achievements as part of the annual gala dinner at NUS Services Convention.